About six weeks ago, I made a double batch of vegetarian party sausage rolls for a friend’s son’s sixth birthday. I had made these sausage rolls for the first time the previous year for his fifth birthday, and had under-estimated the baking time, plus the cross-city Saturday morning traffic, so arrived at Centennial Park after the cake had been cut and freaking out because I had dozens of party sausages rolls that needed to be eaten by somebody, because there was no way I wanted to take them back home. I shouldn’t have worried, because these vegetarian party sausage rolls always get eaten. This year, I was much more prepared – I got up and started baking early but ate far too many sausage rolls in lieu of a proper breakfast so, by the time I got to the party, I was too full to eat any party food, apart from carrot sticks. But after the party sausage rolls had been devoured by others, there was this kale slaw sitting at the end of the table, untouched and I thought it might be an antidote to an overindulgence of party sausage rolls. I served myself up a plate and it was just… so good, amazing in fact. I started praising and recommending it to everyone and, soon enough, I was sitting a picnic table with my second plateful of kale salad and a whole bunch of kale salad eaters (with several kale haters and agnostics amongst them) all of us exclaiming about how awesome this salad was. On my way home from the party, I bought some kale and red cabbage and made it again for dinner. I think I had eaten this salad at least six times in the following week and I’ve had it at least three or four times a week since then. 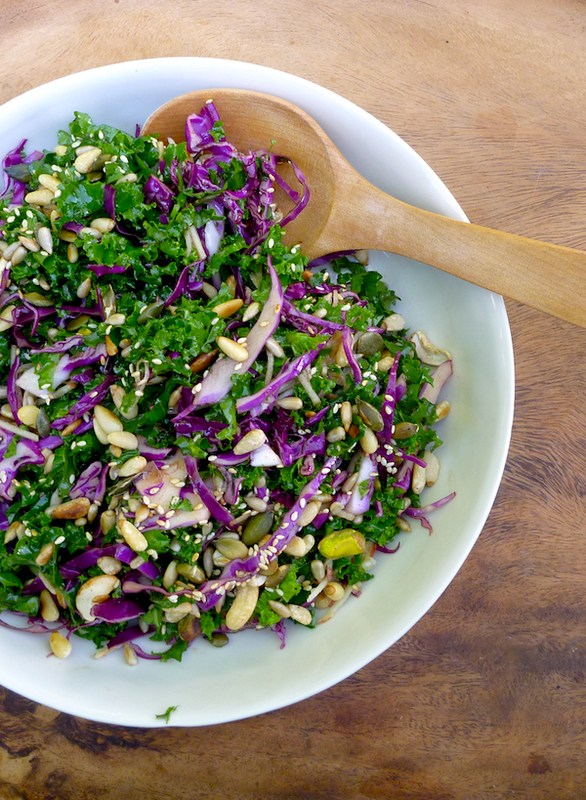 I think on one high water day, I ate this kale salad for breakfast, lunch and dinner. I serve it with anything: dhal and rice, poached egg, or a side for refried beans and tortillas – it can go with just about any style of food – Japanese, Mexican or Indian. I am a total carb lover and hate low-carb food replacements like cauliflower rice or cauliflower pizza crusts (seriously!!?) but I can eat this salad as a complete meal without bread, potato or rice. There is something incredibly satisfying about its crunchy chewiness that stops even my carb cravings. The original salad had a topping of pinenuts and grated pecorino cheese but I rarely put cheese in it now and have replaced the pinenuts with a toasted seed and nut topping. You might think I might have overdosed on it by now but it is still as delicious as the first time I ate it. I buy a big bunch of kale, cut the leaves from the ribs, wash and dry it and store it in an airtight container so I can make this slaw in a flash. It even keeps pretty well and I’ve eaten leftovers the next day for breakfast as a side to scrambled eggs, or on a sandwich for lunch. The only tip I’d give is to not stint on the apple: it’s best if it has that extra sweetness. What else can I say – I love this salad! Trust me, it will convert even the most hardened kale haters. Go out buy a big bunch of organic kale now, and party on. Firstly, de-rib, wash and dry kale and shred finely. Shred red cabbage as finely as possible and grate apple coarsely. 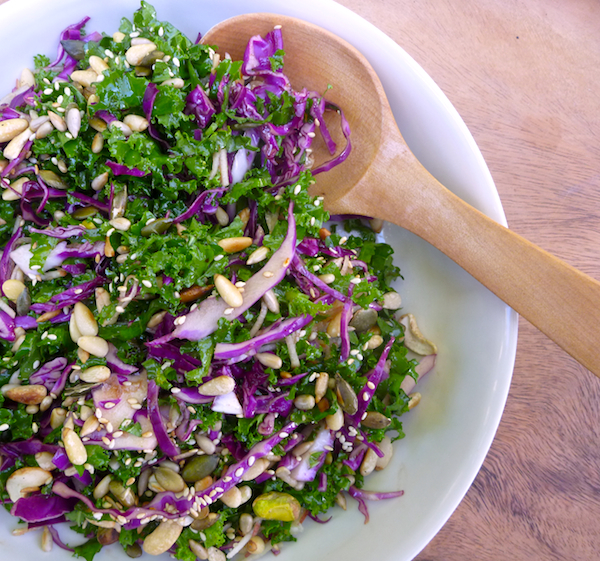 Toss kale, red cabbage, apple and pecorino (if using) in a large bowl and dress generously, first with olive oil, so the salad is nicely coated, then sprinkle with balsamic vinegar. Season with salt and pepper to taste. This salad is best if it’s left to sit at this stage for about half an hour before serving. Toast pinenuts or any combination of seeds and nuts in a cast iron pan. Let cool and sprinkle over salad just before serving.